Caprylic/caprictriglyceride,Prunus Amygdalus Dulcis (sweet almond oil), Cera alba (beeswax) extract, persea gratissima (avocado) oil, Butyrospermum parkii (shea) butter, Theobroma cacoa (cocoa) seed butter, Cocos nucifera (coconut) oil, Actinidia chinensis (kiwifruit seed) oil, Copernicia cerifera (carnauba) wax, Candelilla cera (candelilla) wax, Simmondsia chinensis (jojoba) oil, Olea europea (olive) oil, tocopherol acetate (vitamin E), essential oil fragrance of kiwifruit: citral, citronellol, farnesol*, geraniol, isoeugenol, d-Limonene,linalool. 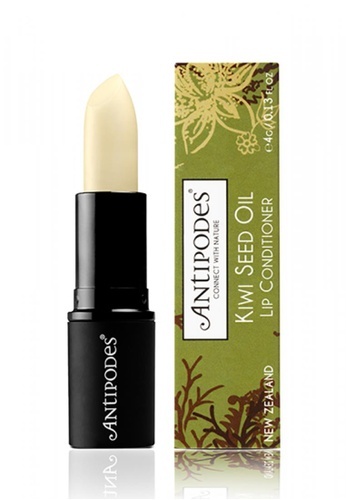 Can't find Antipodes Kiwi Seed Oil Lip Conditioner in your size? Care label Apply as a primer and conditioner under your favourite lipstick, or as an instant moisture boost at any time of day.